Our Holiday Open House was so amazing and fun that we are doing it again this Saturday, November 11th. Get the same great deals on some really great projects! ALSO, we have added give aways! Every hour there will be a door prize. Come on in, browse and win! Just in time for the holidays, we have added a great class that will make a great gift. 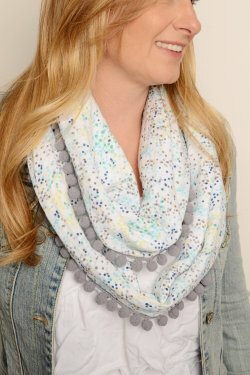 Check out our infinity scarf class. Come with your fabric precut and you will be able to leave with a finished scarf. You're going to want to make more than one. You can sign up here: Infinity Scarf Class. Also, pajama pants class is the same day. You can learn how to make TWO great gifts in one day. There are still openings! We are back from Market and have exciting new things to show you. Make sure you join us on December 9th from 1:00 p.m. to 3:00 p.m. Refreshments and fun!